Fast cars, a hot romance and a behind-the-scenes look at the world famous Indy 500 - Winning has it all. 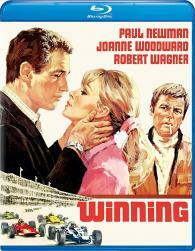 Paul Newman stars as Frank Capua, a hotshot race car driver who will do anything to win. However, this obsession nearly causes him to lose his wife, Elora (Joanne Woodward), and his friendship with arch-rival Luther Erding (Robert Wagner) along the way. Released in 1969, Winning features a believable personal drama, spectacular footage of the 1968 Indy 500 with its famous 17-car pileup and a biting look at the people who make their living in the fast lane.